Student Government Association top four candidates answered questions, outlining their election plans and pushing for votes in a debate Feb. 22. Students packed the Chao Auditorium as candidates for SGA president, executive vice president, academic vice president and services vice president answered questions from members of the SGA Supreme Court. The debate preludes voting, which opens Feb. 27. All SGA presidential candidates, except Abdul Hasib, attended the debate, answering questions on U of L’s upcoming presidential search, ability to handle their potential job, higher education funding and President Donald Trump’s immigration orders’ effect on students. In replacing U of L’s top administrative positions, candidates mandated the next president and provost know students and the university, listening to student voices and involving diverse campus members. Georgie Sook said her sophomore status makes her ideal for the presidential search, allowing her to participate in the whole search process, which is expected to take around 18 months. “We want someone who’s honest. Someone who has a sense of integrity – someone who’s humble and someone who works hard. We’re looking for a fighter,” Sook said. Answering if they could handle the job, candidates recited their experience in juggling responsibilities. “All of my experience there (in university and professional positions) points to successful change – transformative change – and I’d like to continue that as student body president,” Vishnu Tirumala said. Candidates hypothesized lobbying for higher education, citing experience in Frankfort and the SGA president’s influence as a means to push higher education values. On the immigration order, candidates’ actions involved legal firms and resolutions helping support affected students and their families. In closing, candidates highlighted their platforms’ message and what they can bring to the university. 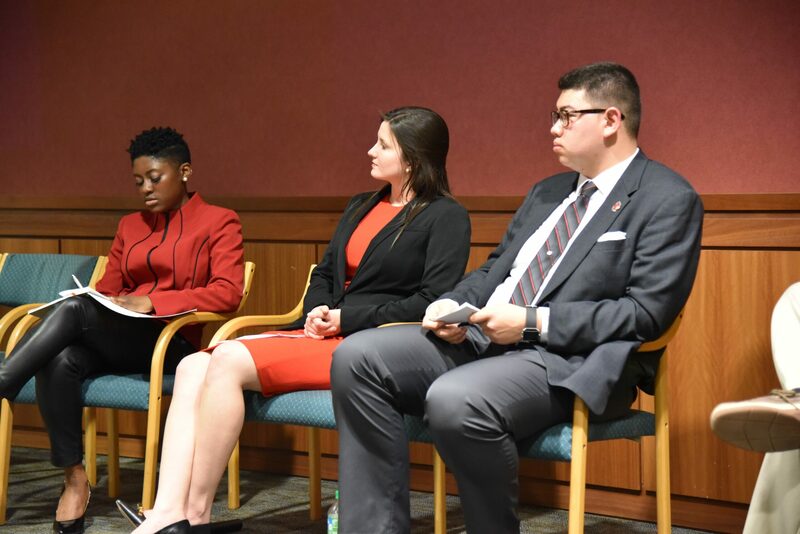 Executive vice president candidates Karen Udoh, Kyle Bilyeu, Sarah Love and Destinee Germany answered debate questions centered on experience, funding and U of L’s diversity. “Something that I definitely gained being the president of Kappa Alpha Theta and also being part of SAB, is knowing how to budget, and knowing how to handle money and knowing how to utilize the money well to make sure that you’re getting the best out of your money,” Udoh said, explaining she would work with recognized student organizations to ensure funding is equally allocated. All academic vice president candidates attended the debate, answering questions related to general education requirements and student feedback. “What’s really important for students is that they understand their options. When I first came to U of L as a freshman, I was told what classes to take,” Kyle Hornback said. Hornback emphasized the need for students to collaborate with advisers and plan their courses. On feedback, candidates emphasized their relations to students and the need to be open to students’ voices. “I understand the importance of listening to everyone as a whole, and standing up for what you believe is right and what you believe should be done,” Jonathan Fuller said, citing past experience with campus groups and administrations. In closing, candidates spoke about dedications to the university and initiatives to help students and academics if elected. Student services vice president candidates Avery Pryor and Chris Bird attended the debate, answering questions related to campus services, food options and student engagement. “I believe that the most important service we’re looking at is mental health services” Pryor said, citing suicide as one of the leading causes for college students’ death. Both candidates endorsed expanding the bike share program and said they are beholden to students. Voting begins Feb. 27 and ends Mar. 2. The Cardinal will endorse a SGA President candidate Feb. 26. Previous U of L alumna Barbara Perry: What makes a good president?